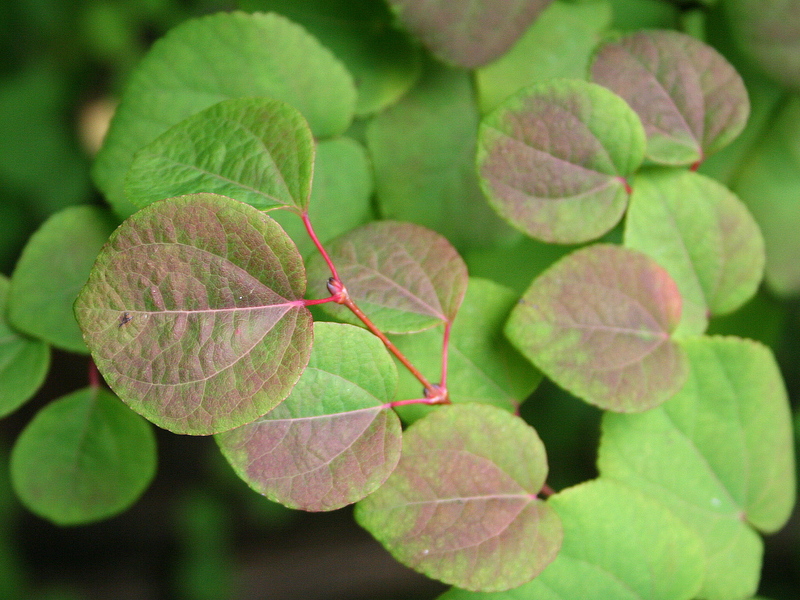 Cercidiphyllum japonicum is a tree to 10 m tall, usually with several trunks, branches with short spurs bearing flowers and one leaf. Leaves opposite on long shoots, solitary on spurs, stalk 2-3 cm long, blade 5-10 cm long, rounded, tip blunt, base lobed, dark blue-green above, waxy-pale below, margin blunt-toothed; new leaves purplish at first; autumn color yellow-orange. Flowers with sexes on separate plants (dioecious), very small, green, inconspicuous; blooming March-April before leaves unfold. Fruit a small pod to 2 cm long, splitting open to release seeds. (Rehder 1968; Dirr 1990). Wetland status: UPL. Frequency in New York City: Very infrequent except as a street tree or horticultural specimen. Habitat: Rich, moist soil (Yatskievych 2006). Notes: Seedlings found in Prospect Park near old specimen trees.